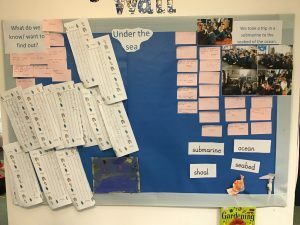 Last week the Reception children put their drama glasses on and went under the sea in a submarine. We saw lots of sea life and tried to use interesting adjectives to describe them. 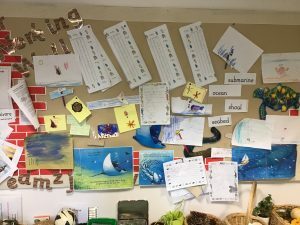 The vocabulary that we learnt last week as ocean, submarine. seabed and shoal. See if they can remember what all those words mean. We had mackerel, squid and octopus in class and this children used the observation skills to write facts about them. 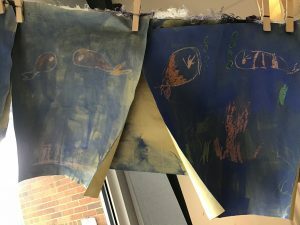 We also did some beautiful under the sea art work. 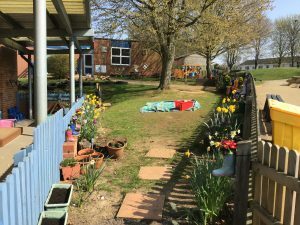 Please take a moment to look at our outside area that is now full of Spring flowers. When we return after Easter we will be thinking about Spring, growing plants and life cycles. This week we have been learning about the story of Easter, who celebrates Easter and why. The vocabulary we have learnt is disciple, enemy, Governor and arrest. Again, please ask your children if they know what these words mean and remind them if not! We have also talked about why we have eggs at Easter (to represent new life, to represent the tomb Jesus was put in and because long ago children didn’t often have eggs and used to save them as a treat for Easter). We hope you all have a relaxing Easter break. The children will come home with new rocket words and please keep up with reading over the break. Re-reading the same book helps with fluency and expression. Reception enjoy outside. Even in the cold! 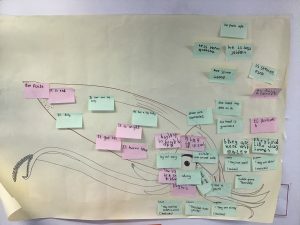 Copyright © 2019 Lings Primary School Blogs. All rights reserved.